I had high hopes for this recipe, but it wasn't quite what I expected. 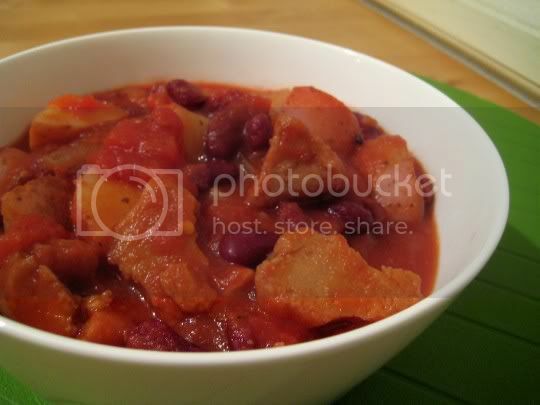 First off, this is NOT a chili; it's a stew. Just because there's beans in it, doesn't make it chili. The potatoes and seitan make up most of the chunky texture. Second, the flavor here is not chili-like at all; it's more like a sweet-savory-tangy dish. The sauciness of the stew comes from tomato puree, which thickens up considerably as it cooks from the potatoes. The "jerk" flavor isn't really what I've known jerk to be: this is very heavy in allspice, and there isn't a lot of heat. A little vinegar and brown sugar add to the overall flavor, but it's still not what I expected. The recipe recommends cooking this in a slow cooker for 4 to 6 hours, but I chose the alternate method of the stovetop for 1.5 to 2 hours. After 1.5 hours, the potatoes still had quite a lot of bite to them (but they seemed to get to their correct-for-stew texture overnight upon reheating the leftovers). While very filling and hearty, in the end I felt like this was nothing more than potatoes, beans, onions, and seitan in a tomato, ketchup-flavored stew. Make again? No. What a poor respresentation of the islands, mon!